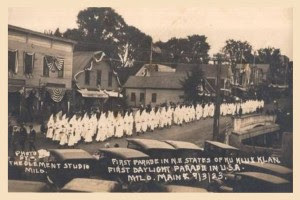 The first USA daylight parade of the Ku Klux Klan was held on September 3, 1923 in Milo, Maine. I describe my hometown of Derby, Maine, population 300 as a suburb of Milo, population 2500, and I remember my Grandmother showing me the postcard shown here around 1955. The Ku Klux Klan parade took place in the same year as the centennial celebration of the incorporation of Milo 100 years earlier in 1823. Today I interviewed a witness to that parade! Previously I introduced a guest contributor to stories of Growin’ Up in Maine featuring Larry Hall, and we recorded his story about ringing the bell one night at the Derby Grammar School. He went there in the 1920’s and I attended the same school in the 1950’s. I mentioned in that episode that Larry, who is 91, and I may collaborate on an album “Ten Decades of Stories”, and I am pleased to announce production has begun! Larry Hall, born in 1916, was 7 years old when he stood on Main Street in Milo and watched that first USA daylight parade of the Ku Klux Klan. Together we are recording his childhood memories a few at a time until we have 10 or 20 for the CD. He picks the topics, and in today’s recording session he completely surprised me by announcing his telling of that historic event. Details of the various participants included a large brass band, horse drawn fire engines, merchants with banners, a group of kids trailing at the end, and much much more. How exciting! On a special historical note about the infamy of that parade, the citizens of Milo eventually discovered the true purpose of the Klan, and in less than 2 years they were driven out of Milo. They were told before the parade started to uncover their hoods, and then the grand marshall on horseback was confronted and threatened, so the event took place without restrictions. As shown in the photograph, they were wearing the hoods. Thus occurred the first indication of their violence, hatred, and true purpose. Two years later they were no longer welcome in the entire state. Readers interested in purchasing a copy of the Ten Decades of Stories CD will be provided details once it’s completed later this year. Email me now to reserve a copy, or several, and knowing how many will help us calculate a quantity for the first production run. My involvement is strictly voluntary, so sales minus cost of production go directly to my newfound 91 year old friend.